A pond inside the John F. Kennedy Memorial Forest in Forest Park. On this toasty July morning, the walking trail was shaded by massive oaks that block out the sun — and also the view of high-rises just across Skinker Boulevard. Calling birds and humming cicadas muffled the noise from the roadways. This paved walking trail can seem farther removed from the bustle of city life than it really is. 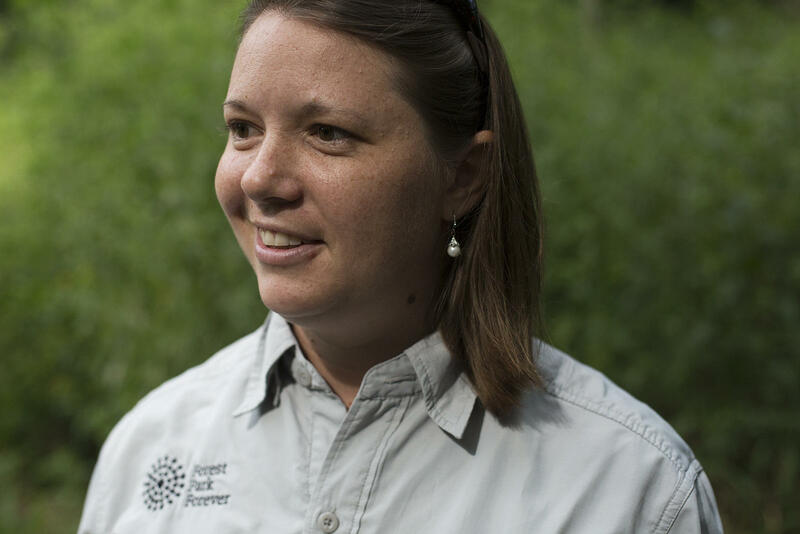 Listen to Forest Park ecologist Amy Witt talk about the wildlife that call the park home. Forest Park ecologist Amy Witt. Doshi said she’s been trying to keep deer out of her home garden, and she just assumed that since deer are so prevalent in the region’s parks, they were probably at Forest Park, too. But according to Witt, the Forest Park gardeners don’t have to worry about deer munching on the landscaping because deer rarely visit. Witt says there’s an upside to having few deer visitors. "It does help our habitat restoration efforts because they’re not eating the supple young shoots or younger saplings that we’re planting,’’ she said. The park’s location in the center of a busy urban area makes it less accessible for deer than many of the region’s parks. Witt says the few who do show up, probably come by way of MetroLink. A trail winds off the main path in the Kennedy Forest. Other wildlife visitors have been observed crossing Skinker. If you have a question about the wildlife at Forest Park, Witt has probably heard it. That critter you spotted in a park waterway was either a mink or a muskrat. The park's rat snakes and midland brownsnakes are nonvenomous and aren't looking for a fight. Coyotes occasionally wander into the park, but if you want to see a large predator, you’ll have to go to the Zoo. A carpenter bee stops on a flower in the Kennedy Forest. “I think a lot of people are surprised that we have fox that reproduce in the forest,’’ she said. “For the last three years we’ve had a vixen, which is a female fox, and kits, which are the babies. The 60-acre Kennedy Forest was established in 1964 and was the first area of Forest Park to be set aside for environmental conservation. It’s a prime spot for area bird-watchers, especially during spring and late summer when warblers and other migratory birds stop by as they make their way along the Mississippi River. Cooper’s hawks and red-tailed hawks hang out at the park year-round, feasting on small mammals — creatures like mice and voles. Witt said the hawks do their part in keeping the park’s ecosystem in balance. A view of the savanna in Kennedy Forest. Bird-watchers have recorded sightings of 216 different species of birds within Forest Park, ranging from migratory birds to those commonly found in St. Louis backyards. There are 170 acres of natural habitats scattered around Forest Park. With the help of volunteers, park employees have been eliminating invasive plants like honeysuckle, while encouraging the growth of native plants — which are food sources for native wildlife, Witt said. An example is the eight-acre savanna that’s tucked away in the Kennedy Forest — where colorful Missouri wildflowers host hummingbirds, bees and other pollinators. Thirteen million people visit Forest Park every year, but most of them have what Witt calls a “focused intent.” They head straight to the Zoo or museums, or to catch a show at The Muny. But the park’s natural habitats can offer a quiet respite from the pace of urban life, she said. Children benefit from a balanced diet of screen time and outdoors time, studies show. In the St. Louis area, several camps and summer youth jobs focus on environmental education and exploration. St. Louis Public Radio visited a smattering of them to see what kids are learning. Scientists have started to take stock of the turtles that live in Forest Park to protect them from upcoming construction projects and improve their habitat. The project, called the Wildlife Impact Mitigation and Inventory Plan, aims to catalog the different species that live in the park, particularly along a 2.5-mile waterway. When a native bee received federal protection under the Endangered Species Act for the first time earlier this year, it drew an attention to a growing public concern. Many bee species in the United States have become threatened or have declined sharply in the last couple decades. Since native bees are crucial to pollinating crops, scientists are making a major push to keep track of them. Researchers at Webster University and the Saint Louis Zoo are inviting residents to help the effort by leading a bee photo survey in Forest Park this Saturday. Images taken at the St. Louis Bee Blitz will help scientists better understand the abundance of various native species that live in the area.